The human body was never built to be seated for long hours at a stretch. Our modern office culture of continuous sitting has affected our health in the form of a whole range of repetitive stress and serious, long term ailments and diseases. Unless we take urgent steps to adopt health and wellness initiatives at our workplaces, we are going to end up with a whole generation of professionals irreparably damaged by their modern sedentary lifestyle. 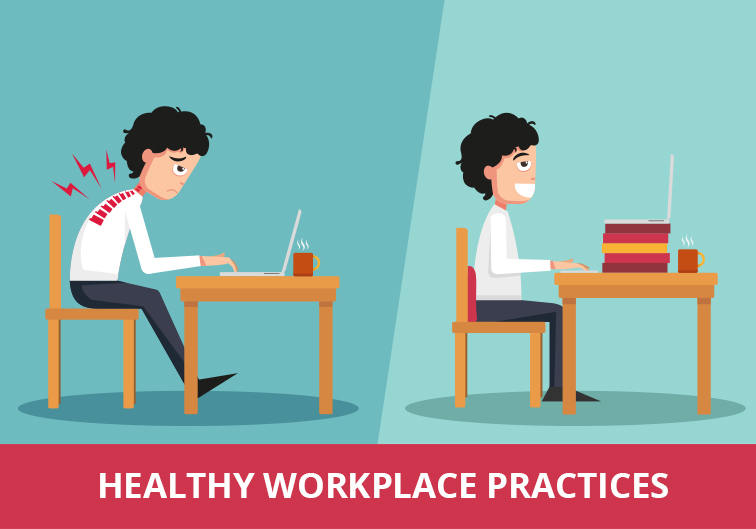 As we take steps to build healthier workspaces, we know that we must begin at our desks. Copy this code to display the infographics in your Website or Blog. Even as offices and communal workspaces have evolved over the past centuries, desks and chairs have remained an integral part of the workstation design. This is because the model has proved to be highly productive and profitable for companies and enterprises that follow it. Working at a desk allows an employee to be seated and at rest – able to focus entirely on the task at hand and easy to be supervised and managed. While we agree that desks have always been a ubiquitous part of our offices, the amount of time that we spend seated at our workstation has steadily increased over the last few decades. Today, an average office worker spends more than 80% of their workday seated at their desk. Yet, the alarming fact is that our desks and chairs are rarely optimized for our bodies and our long term health needs. The way we sit normally – with our back bent and our shoulders slumped forward – puts a lot of pressure on the ligaments that stretch to accommodate our spine’s curve. Sitting for long hours also pressurizes and compresses the spine. 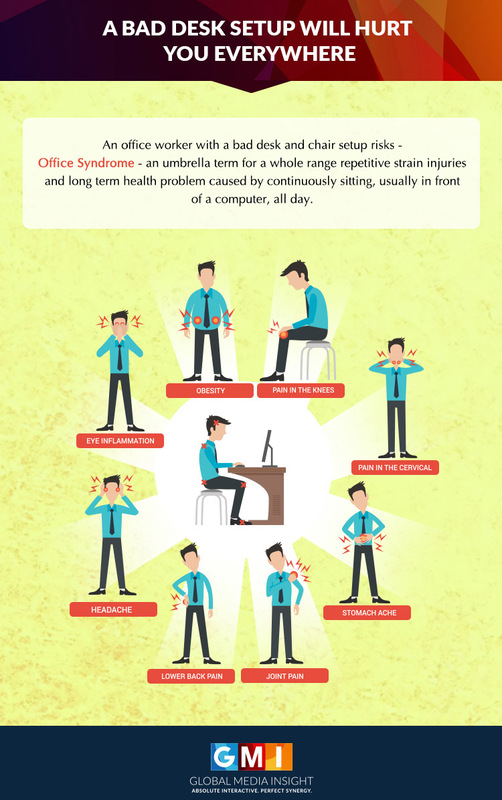 Such harmful desk habits have given birth to modern ailments like Office Syndrome – an umbrella term for a whole range repetitive strain injuries and long term health problems that include headaches,back and neck pain,eye strain and more. There was time when smoking was one of the most hazardous lifestyle habits in the world. Today, the title has more or less been won over by our lifestyle of continuous sitting. We sit down for our breakfast, we sit down as we travel to work, we sit down at our desks and we sit down for our entertainment at the end of the day. Our bodies aren’t built for such a sedentary existence. The human body is built to move. The blood in our body circulates better if we move around more. In fact, people who sit for a majority of their day are more likely to die from heart diseases. But overcoming the ill-effects brought on by a lifestyle of continuous sitting, to embrace health and wellness, is not a hard task. In fact, making a few changes to how your desk is designed, taking regular breaks to stretch and walk around the office, and a few hours of exercise every week can go a long way. Ideally, the monitor should be at eye level and 20-30 inches from your face. The easiest way to measure this is to sit back as you work and stretch out your hands. The optimum distance is when just the tip of your fingers touch the screen. Maintaining this will not only help you avoid having to strain your neck up or down to look at the screen, but will also help prevent unwanted eye strain because of the glare from the screen. If the text on the screen looks too small because of your position, increase your font size till it is comfortably readable. 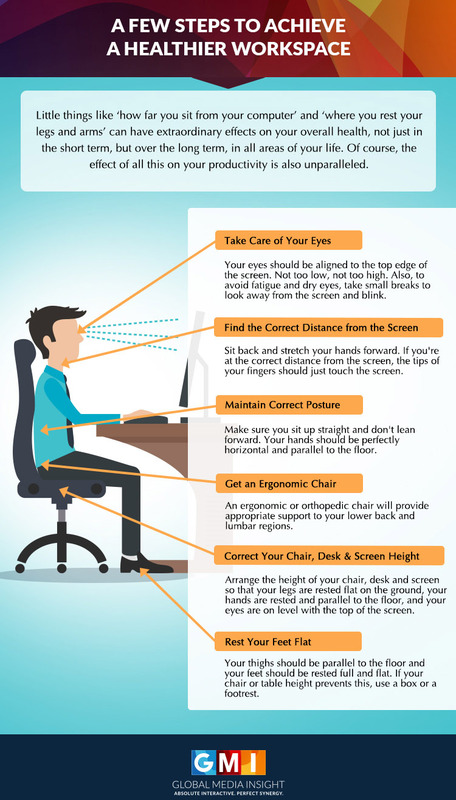 Maintaining the right posture while sitting can go a long way towards preventing a lot of repetitive strain injuries. An ergonomic chair can help provide lumbar and lower back support, while maintaining alignment with your body’s natural curves. Your elbows should be supported by the arms of the chair and your hands should be able to reach the keyboard comfortably. The chair should be comfortable to sit on and should allow for free movement. But, regardless of how ergonomic your chair is, make sure to change your posture regularly and avoid staying at one position for long periods of time. Make sure your ergonomic chair has adjustable height setting to allow you to find the most comfortable and correct seating for you. The height of your chair and desk should be such that your forearms and thighs are parallel to the floor. Your feet should rest comfortably on the floor and there should be a fist-wide gap between the seat of your chair and the back of your knees. Ideally, your knees should be slightly lower than your hips. Twisted, misaligned positions for your mouse and keyboard can lead you to bend your arms and body unnecessarily, and often unknowingly. The alphanumeric part of your keyboard should be cantered to your body. Ensure that your most commonly used devices (telephone, mouse) are within easy, comfortable reach. Placing them within the length of your arm and at a height between your waist and shoulder will prevent the need to stretch out to reach them. No matter how optimized and ergonomic your workstation is, you still have make an effort and be mindful of how you use it. Ensure that you sit up straight and don’t slouch in your chair. 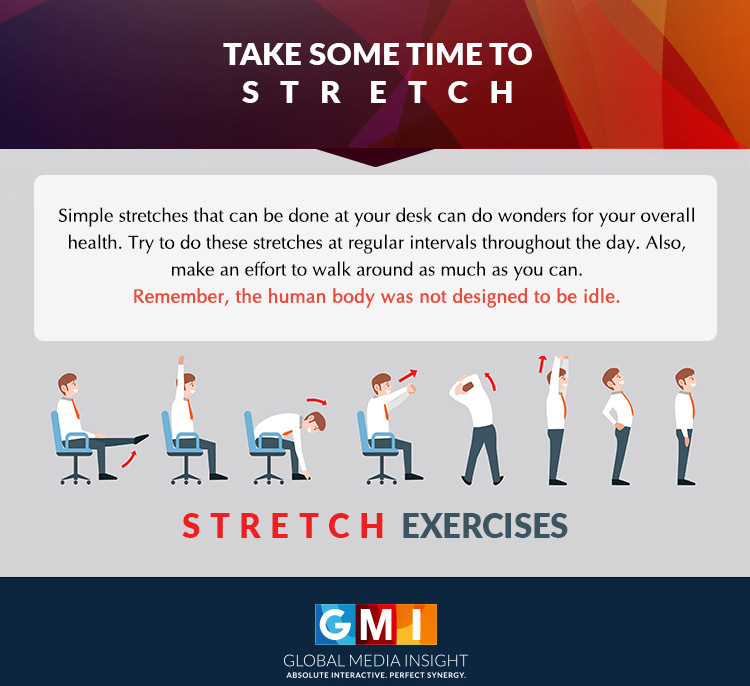 Also, make sure that you take regular breaks to walk around and stretch. At least a few hours of exercise every week is very important to adopting a healthy lifestyle and negating the effects of continuous sitting. It’s important to start making these changes now, and not after your body starts sending you painful reminders and notifications. The average office-worker spends nearly 7 hours in front of the computer, either at office or working from home. Most employees who spend the maximum part of their work day in front of the computer screen complain of sore, irritated or watery eyes. Some even complain of blurred or double vision, and have trouble focusing on the task at hand. 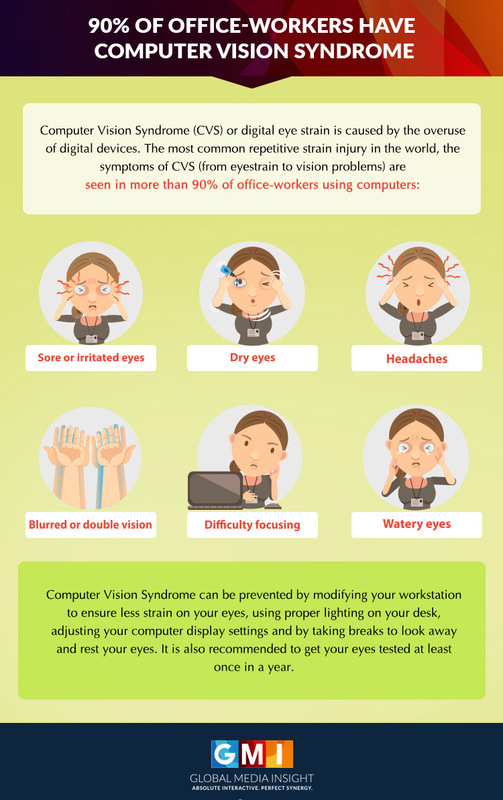 Recent surveys have revealed that a staggering 90% of the working community worldwide suffers from Computer Vision Syndrome (CVS) or Digital Eye Strain. This is a set of eye and vision problems and is a direct result of the prolonged use of digital devices, be it your computer, phone, tablet or e-reader. But, there’s help at hand. Blink blink: Blinking allows your eyes to be washed by your tears and keeps them lubricated. 20-20-20 rule: Every 20 minutes, remember to look at something 20 feet away for 20 seconds. Right light: Get your light right by reducing bright overhead lighting. Also, make sure that your desk lamp is not shining directly on you. A glare screen is a good investment. It also important to place your screen to minimize reflections. Check your monitor: It should be at least 20 inches away from your eyes and the centre should be about 4 to 6 inches below your eyes. Adjust the brightness, polarity, resolution, flicker and contrast on your screen settings to your comfort. Computer glasses: These special anti glare glasses can help in protecting your eyes from damage. If you have vision issues, you need to wear corrective lenses so as not to escalate your vision issues. Annual eye checkup: Visit your eye doctor once a year for your annual eye checkup. The doctor will not only check you for computer vision strain but also for other health issues like diabetes, high BP, glaucoma, macular degeneration and other concerns. Employees often tend to find some excuse for not exercising. Most office-goers are hard-pressed for time, while a few others seem to be in an eternal quest for a better gym. And if at all they happen to come across a gym with a better trainer and equipment, it will be far beyond their reach and budget. How do we tackle this? Before that, let’s discuss why you should tackle this? Exercise is generally misconceived for reasons, such as bodybuilding and weight-loss, which are not true. Whether or not you are overweight or underweight, you should exercise to keep your body fit, healthy and, of course, free from diseases. office-workers, especially! Today, a typical professional spends eight to nine hours sitting at his office-desk and then spends rest of his day sitting in front of a T.V. or in his car. So the need for exercise cannot be ignored. Cut back to our earlier point, how do we tackle employees’ most common excuses for not exercising. Let’s put it as challenges, instead. Those who face the above-said challenges have no other go but to turn their workplace into gyms. You may think but how amidst all these deadline bound work, mails, meetings and conference calls? There are a few office exercises that you can do while sitting at your desk or in the corridor or on the stairs. One of the most important of them is stretching. If you have closely observed animals especially cats and dogs, you might have noticed this scenario: they sleep for a couple of hours, then wake up and do some stretching and yawning, before they begin to wander. This is very beneficial not only for animals but also for human beings. Stretching facilitates fluid movements of the body. When you sit for longer hours before a computer, you are likely to be a victim of certain musculoskeletal disorders and problems like back pain, carpal tunnel, neck and shoulder pain, etc. However, doing a full-body stretch can help you keep these at bay. Ever heard of endorphins? Endorphins are a type of feel-good chemicals the release of which can help reduce stress in your workplace and enhance happiness level. And these office exercises can boost your endorphin level to the max. Less stress means more productivity! At GMI, we always encourage our team of Digital super specialists to make these simple lifestyle changes to add years to our lives.